Neighbor Mike wrote: My experience with Mirai is a nice crunchy ear of corn yet tender and more sweet than any other ear I have ever tried. I never cook an ear more than 5 minutes in water or 10 on the grill when in the husk and typically wrapped in foil. I don't like Mirai caremelized from grilling, but I do like to do that with other ears of sweet corn. We just bought a bunch at the Andersonville market yesterday. As they were handing it to us, they said: "Microwave for two minutes in the husk or boil it for two and a half minutes out of the husk." That's most likely better advice than what I gave. When multi-tasking in the kitchen and potentially out at the grill as well, I just try to make sure that no more than 5 minutes go by before I pull it out of the water. On the grill, I have it wrapped in the husk and typically in foil so it takes a little more time to get it up to temp, but 10 minutes is the absolute max. Dealing with other items on the grill and a kid who is determined to distract me can cause a delay so my times are probably more my reality than ideal. 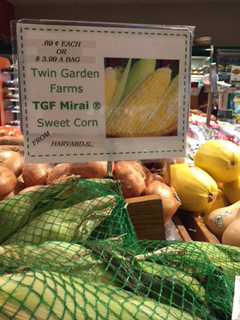 My Gurnee friend took me on a field trip over to TGF in Harvard today for that much-mentioned Mirai corn. Here's what I think--have you ever tried to just eat it raw? I honestly don't think it benefits from cooking (at least not 'wet' cooking--grilling may be another matter). We ate a couple of ears of it in a park, sticky juice dribbling everywhere. But it tasted like a delicious apple to me, which is perhaps is not what you are looking for in a sweet corn. i had to try it once. Yesterday at the French Market in Wilmette the gentleman who was selling Mirai corn was handing out tiny ears of the corn encouraging people to eat it raw. Guess their product is still strong. Have not cracked it open yet to report. $5.00 for 6 ears, 10.00 for 18.
jayinchicago wrote: My Gurnee friend took me on a field trip over to TGF in Harvard today for that much-mentioned Mirai corn. If anyone wants to try it at a very reasonable price ($1 or $1.50 I cannot remember), it is served at the Boone Co. Fair adjacent to the 4-H Food booth. Nichols at the oak park farmers market was selling mirai ears for $0.50/ea or 6 for $2 (i believe). I got some regular corn from The Farm instead, and it was awesome. I tried some (mirai) this year, and then tried corn from various farms around the area. Mirai was not the sweetest or best of the lot. I always buy corn before 10 AM, that way it isn't more than 2 - 3 hours out of the field. If I'm not going to use or process it immediately, I put it in the frig. until I can. It all makes a big difference. Mirai is available at the Elgin farmer's market on Thursdays. I enjoy it raw. Skokie Farmer's Market this AM. Sweet, crunchy, delicious. Mirai Corn, Skokie Farmer's Market. Mirai Corn, Count me a Fan! We got some (at least, it was marked that way on the sign) at the Logan Square market this morning. They sell it at the Wilmette market, which I go to on rare occasion. The beef I have with them is that you cannot pick out your own corn, and unless you want 18 ears of corn or whatever, it is more expensive than Nichols corn. Nichols told me they use the same seed as these folks. At the Evanston farmer's market I usually get my corn from either Nichols or Jon First. They have by far the best corn. I buy Mirai Corn at Casey's in Naperville. You can purchase single ears or by the bag. Picked up Mirai corn for the first time this season at Daley Plaza on Thursday. Stripped from the cob I had a smidge over 6.5 lbs from 24 ears. It was $15. I used it for Paul Virant's chow chow ( one of my favorite pickles/relish/preserves). The yield was 10 pints. The vendor at Daley mentioned they would be around another week or two so I hope to do the same at least one more time this season.